Overmolding is the precision plastic injection molding process where one material is molded over a second material. When overmolding plastic, proper material selection is critical – the two plastics do not have to be the same, but they must be compatible. For example: you should not plan on injection molding the second material onto the first material if the second material will melt or distort the first material. One should not deform the other where it matters. If the proper materials have been chosen, the two materials bond together chemically and mechanically. This process yields a strong finished piece with a long life. In some cases, employing this process can be less expensive than post-molding fabrication. Our staff works with a wide range of engineered resins, and can help you select the best resins and molding process to deliver consistent, reliable product quality. 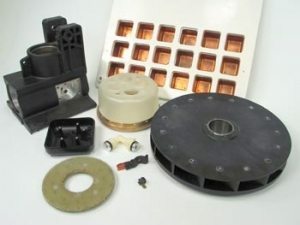 At PMC, our engineers do everything from overmolding electronics to medical devices. We have years of experience helping customers optimize the best solution for their specific product. Contact PMC with any questions; we’ll respond shortly!